I’ve struggled for months trying to write about GMOs. The problem is that there is not a lot of conclusive evidence either pro or con but there are a lot of really strong opinions. For a segment of his late night talk show, Jimmy Kimmel sent a “Man on the Street” to a local farmers’ market to ask the patrons about GMOs. 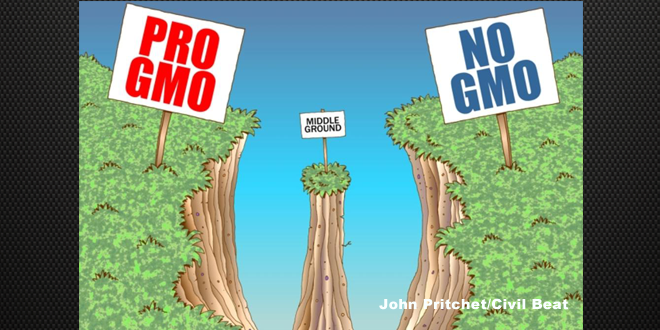 Most of the people interviewed were firmly opposed to GMOs…but very few knew what they were. In answer to the question, “What is a GMO?” One woman answered, “I don’t know. I know it’s like…some corn…bad stuff. I know it’s bad but to be completely honest with you, I don’t really know.” Another woman, in answer to the question, “Do you avoid GMOs?” responded, “Absolutely, because they’re not good for you!” But she couldn’t answer the question of what they were. There is a lot of confusion and misinformation as well as arguments for and against GMOs but an unbiased jury is still out for the most part. A Genetically Modified Organism (GMO) is an organism whose genetic material has been altered so that its DNA contains one or more genes not present naturally. DNA may come from a different plant species as well as from non-plant forms such as fish, frogs and bacteria. The purpose is to provide plants with beneficial traits not normally present. In spite of the greedy corporation image portrayed by dissenters, the goals of GMO research are generally noble: to increase crop yields, decrease chemical use and improve nutritional value of specific crops. The major crops that are genetically modified are corn, cotton and soybeans. The vast majority of corn, soy, canola and sugar beets grown in the United States are genetically modified. Consumer Reports announced that their testing indicated that unless a corn-based product, such as chips or cereals, comes with either an organic or non-GMO claim on the package, it mostly likely contains genetically modified corn. Sugary cereals are often sweetened with sugar from beets and 95% of the sugar beets grown in the United States are genetically modified. 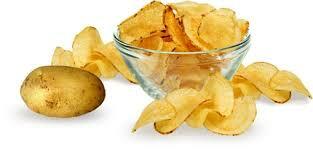 Alfalfa has recently been deregulated and potatoes are among some that are currently being studied. Most common garden vegetables are not yet genetically modified simply because the financial return in the market is not sufficient to warrant the cost of the research. One way GMOs can increase crop yields is by making it possible to grow crops in areas that previously could not sustain them. The lack of water and excess salinity in arid regions is difficult to overcome. The resurrection plant, Xerophyta viscosa, a native of dry regions of southernmost Africa, possesses a gene that allows it to survive long periods without water. Experiments have shown that plants given this gene are less prone to stress from drought and excess salinity. Scientists are working to introduce that gene into wheat and maize to grow in sub-Saharan Africa. The Water Efficient Maize for Africa project (WEMA) was created to developed water efficient, royalty free maize to the smallholder farmers. The project is led by the Kenyan-based African Agricultural Technology Foundation and funded by the Bill and Melinda Gates Foundation, Howard G. Buffett Foundation and USAID. Monsanto has provided technical advice as well as donating its commercial drought-tolerance and insect-protection traits royalty-free to all seed companies in Africa. Researchers have also discovered that plants with high tolerance to salt stress possess naturally high levels of a substance called glycinebetaine. Genetically modified tomatoes with enhanced glycinebetaine production have increased tolerance to salty conditions making it possible to raise tomatoes where they previously would not grow. Another way GMOs can increase crop yields is by producing plants capable of resisting fungal, bacterial and viral diseases. Late potato blight is caused by the fungus Phytophtora infestans. This was the fungus responsible for the great Irish potato famine of 1846-1847, which led to the deaths of more than one million people. In the late 1980s, the University of Hawaii began developing a papaya cultivar resistant to the papaya ringspot virus. These new, genetically modified papaya plants are no longer susceptible to the ringspot infection, allowing farmers to cultivate the fruit even when the virus is widespread. The first virus resistant papayas were commercially grown in Hawaii in 1999. Transgenic papayas now cover about three quarters of the total Hawaiian papaya crop. In Uganda the spread of the bacteria, Xanthomonas, has affected banana plants and cost farmers several hundred million dollars annually. Ugandan researchers are currently working on developing bananas resistant to Xanthomonas wilt. Not every attempt has been a success, however. Trials to develop a virus-resistance sweet potato for hard hit areas of the African continent have failed so far, but research and testing continue. A second goal of GMOs is to reduce the use of chemicals in farming. Bacillus thuringiensis toxin (Bt) is an insecticidal protein that comes from soil bacteria. Bt toxin is approved and widely used in organic farming because it is harmless to mammals. By inserting Bt into the plant’s DNA the plants are able to defend themselves against pests on their own. However, the resulting GMO plants were rejected by organic farmers who liberally spray the exact same toxin on non-GMO plants of the same species. Ecologically speaking, the GMO is better for the environment because it actually reduces the amount of toxin being used leaving less to leech into the ground and water table. Furthermore, the Bt toxin affects only the pests which eat the crop carrying the genome, lowering the risk of harm to beneficial insects. In Nigeria the larvae of the moth, Maruca vitrata, attacks legumes causing crop damage worth nearly $300 million annually. Scientists from the Ahmadu Bello University in northern Nigeria have developed a pest-resistant black-eyed pea to control this particular insect. In addition to reducing chemicals for insect control, GMOs are also engineered for the fight against weeds. Excessive weed growth forces crops to compete for sunlight and nutrients, often leading to significant losses. Because herbicides cannot differentiate between plants that are crops and plants that are weeds, conventional agricultural systems can only use 'selective' herbicides. Such herbicides only remove the specific weed for which it was designed and do not harm the crop. The down side is that there are many non-specific weeds left in the fields. If farmers use herbicide resistant crops, 'non-selective' herbicides can be used to remove all weeds in a single, quick application. This means less spraying, less traffic on the field and lower operating costs. 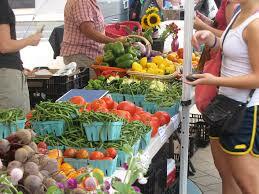 Another goal of GMOs is to increase the nutritional value of foods. In America we have easy access to vitamin supplements. Furthermore, many of the foods available in the grocery store such as cereals and breads have added iron and vitamins and milk is routinely fortified with vitamin D.
Fortification means artificially mixing nutrients in to foods during processing. In poor regions of the world where people generally grow their own crops rather than buying processed food there is no opportunity to fortify foods. Millions of preventable deaths occur and many of the children who do survive a malnourished childhood have their life prospects permanently harmed because of poor childhood nutrition. This is where biofortification is promising. Biofortification is the process of breeding missing nutrients into staple crops to increase their nutritional value either through conventional selective breeding or genetic engineering. Biofortification focuses on making plants more nutritious as they grow rather than having nutrients added to the foods as they are being processed. People in poverty generally live on cheap accessible food like rice or corn. These crops deliver calories, but do not provide a balanced diet and are lacking in vitamins and minerals. In some cases, nutritionists found that just giving malnourished children a vitamin A capsule every six months cut the death rate among those children by about 25 percent. It isn’t financially feasible to deliver supplements to remote areas on a regular basis so scientists began to experiment with breeding varieties of staple foods from those areas to be naturally higher in nutrients and iron. The theory is that once these enriched plants are developed the farmers can save seeds and grow the fortified plants year after year providing healthier food to remote and poverty stricken areas. The traditional varieties of sweet potato in Mozambique and Uganda are white or yellow fleshed and deliver little or no vitamin A. A new orange-fleshed sweet potato has been developed which is high-yielding and drought tolerant. Vitamin A intake increased by two-thirds for older children and nearly doubled for younger children and women by the end of the project test period. For children 6–35 months, who are especially vulnerable, the orange-fleshed sweet potato contributed more than 50% of their total vitamin A intake. Because the orange-fleshed sweet potato was produced with conventional breeding, it has not been subject to anti-GM opposition or fears about food safety. 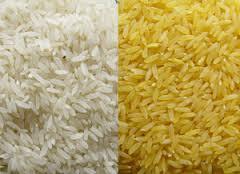 However, vitamin A deficiency is also a widespread problem in regions of the world where rice is the staple food. “Golden rice,” a rice cultivar with enhanced levels of beta-carotene and other carotenoids, is being designed for consumers and growers in the Philippines. Although the end result of increasing the Vitamin A content in native plants is the same, unlike the cross-bred sweet potato, golden rice is facing severe opposition because the scientists used a transgenic approach to biofortification. Other nutritional success stories include carrots high in calcium to combat osteoperosis and tomatoes high in antioxidants. HarvestPlus, a leader in biofortification, is introducing vitamin A cassava in Nigeria and vitamin A maize in Zambia. Iron fortified beans have been released in Rwanda and iron enhanced pearl millet in India. A GM potato developed in India with a gene from the protein-rich amaranth plant contains one third more protein than its natural counterpart. In addition to increased nutrition, research is being done to reduce allergens by modifying nuts to reduce the proteins that cause allergic reactions and engineering bananas which would naturally contain a vaccine for hepatitis B. There is also the basic marketing side of GMO research, such as developing fruits with a longer shelf-life: The FlavrSavr® tomato is the most famous example. Apples, raspberries and melons with delayed ripening have also been developed. 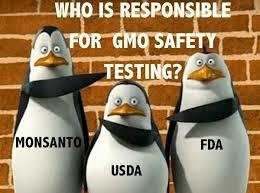 GMO research covers a wide variety of other issues. For example, poultry manure is very high in phosphorous and can be an environmental issue in some areas. In response, scientists have genetically modified alfalfa to add to poultry feed. The alfalfa contains high levels of phytase, an enzyme that can reduce phosphorus discharge by up to a third. Some genetically modified microorganisms are designed to help the environment by reducing toxic pollutants. Many plants are naturally capable of taking up small amounts of heavy metals. A gene from the bacterium Escherichia coli was transferred into poplars enabling the transgenic trees to produce an enzyme capable of binding to heavy metals. Poplars with an enhanced ability to extract toxins from contaminated soils take the metal up by through the tree's roots and store it in its wood and leaves for disposal. Transgenic plants have been used to produce biodegradable plastics such as polyhydroxybutyrate (PHB). PHBs are physically similar to polyethylene but are100% biodegradable. Genetically modified rapeseed oil is also used in plastics as well as in high-grade industrial lubricants. According to the American Association for the Advancement of Science (AAAS), the current fear and efforts to require labeling of foods containing products derived from genetically modified plants are not based on evidence that GM foods are dangerous but rather on the concern about what might happen and the perception that such foods are "unnatural." The AAAS claims that the science is quite clear: crop improvement by the molecular techniques of biotechnology is safe. Even in the highly litigious USA, there have been no lawsuits, no product recalls, no reported ill effects, and no other evidence of risk from a GM product intended for human consumption since the technology was first deployed commercially in 1996. In response, critics claim that there has not been enough independent, post-commercial testing of most GM crops. This is one of those areas where it is hard to judge. Who can say what is enough? Those in favor of GMOs say there has been sufficient testing. Those opposed to GMOs say there are still too many unknowns and point to areas of concern they say have not been fully addressed. One area of agricultural concern is that genetic engineering might offer advantages that would eventually lead to the widespread use of only a few crop varieties. If a disease or pest begins to attack this “monoculture” it could quickly spread through a region wiping out all the crops. Biodiversity is a safeguard in that different varieties of the same crop offer variation in resistance to pests and diseases. In general, however, seed companies rarely release only a single cultivar with a new genetically engineered trait. They tend to introduce the same trait by breeding it to many different cultivars. Therefore, using genetically engineered crops doesn’t necessarily mean reducing the diversity of cultivars. Another concern is that family farms would become overly dependent on large seed companies who have done the most with genetically engineered varieties. They contend that companies, like Monsanto, would have too much of a monopoly for farmers to be able to compete. Some critics claim that the use of herbicide resistant crops, such as Round Up Ready corn or soybeans, will lead to the development of herbicide resistant weeds, much like antibiotic-resistant bacteria. There seems to be some evidence to support this concern. While the use of insecticides has declined since the introduction of GMOs in the mid-1990s, the used of herbicides has increased greatly. A survey done by Stratus Agri-Marketing in 2012 discovered that almost half of the farmers throughout the United States are battling weeds that seem to have developed an immunity to glyphosate, the main ingredient in Round Up. Also related to weed control is the issue of balance in the ecosystem. Some wild plants on the field can actually be helpful in attracting animals known to deter pests. Those opposed to GMOs argue that there should be some non-crop plants left in the fields and surrounding area for biodiversity in the ecosystem. Another concern is the potential of GM plants passing their new traits on to wild relatives. The wild species could theoretically be changed enabling them to out-compete and perhaps eliminate other species. 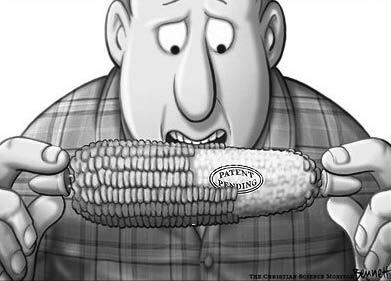 In the area of consuming GMO products the testing is inconclusive. Those opposed to GMOs point to animal studies that have suggested GMOs might cause damage to the liver and kidneys or compromise the immune system. The bottom line seems to be that the major concerns with GMOs are not what has been observed but the fear of what might happen. Those who favor GMOs state that there is no credible evidence that anyone has ever been harmed after 15 years of GMO products on the market. Opponents point out that “no evidence of harm” is not the same as being proved safe. Robert Gould, president of the board of Physicians for Social Responsibility claims that the time frame has been too short to know the long-term effects that could arise after a lifetime of consuming GMOs. Many are currently advocating for labeling so that doctors treating immune system problems or allergies would have more complete information about what the patient is consuming. In all honesty, it was not because the tomato had been genetically modified, but because Mr. Ramos was allergic to seafood and unknowingly ingested a known allergen. For the majority of the population the GM tomato would be safe. Labeling the tomato as a GMO in this case would not have been sufficient. The labeling would have had to specify the actual ingredients in order to alert consumers to possible allergens. Perhaps that may be the labeling compromise. Genetically modified products surround us from the pump at the gas station to the soda pop in the grocery store or the cereal we feed the baby. For now it is up to the individual consumer to decide what to consume and that is at the core of the labeling debate. It appears the debate will continue to rage for some time to come. 2. “GMOs: Your Right to Know,” Consumer Reports, March 2015, 7.